Does spherical ice a) melt slowly, b) cool quickly, and c) dilute the drink less? Since a sphere will have less surface area, for the same volume of ice, this means there is less contact between the ice and the liquid being cooled. Therefore, I expect less melting, but also slightly slower cooling. Add a single sphere ice to the glass. Add 3 fl. oz. of bourbon to glass. Mass glass with ice and bourbon. Place temperature probe into glass. Record temperature until the bourbon reaches an acceptable drinking temperature, or stops changing. Remove probe and mass again. Remove ice and mass glass with bourbon. Repeat steps 1 through 9 using an equal mass of ice cubes. Enjoy responsibly with a fellow doer of science. Two glasses of Bourbon on the Rocks. Left glass contains a single ice sphere. Right glass contains 5 ice cubes. The right also has the temperature probe used in this experiment. Both glasses contain 3 fl. oz. of bourbon. Note: this photo is not from the actual experiment and was taken later. To determine how much ice melt occurs during the course of cooling, a series of mass measurements were taken to facilitate determining the mass of ice before and after each trial. The table below gives each of these measurements. Based on the raw measurements, the masses of each component were computed, as show in the table below. During the cooling phase of the experiment, temperatures were recorded every half second. Below is a graph showing the 5 second average temperature until the temperature stabilized (<0.01ºF/s). The slight uptick at the end is from the removal of the probe. Both the sphere and the cubes start cooling the bourbon very rapidly. The sphere however slows considerably around 35-40 seconds and comes to a final temperature around 39ºF. The cubes maintained a faster cooling rate and reached a final temperature around 33ºF. The cubes achieved this additional cooling in approximate 30 fewer seconds, starting with 8g less of ice. 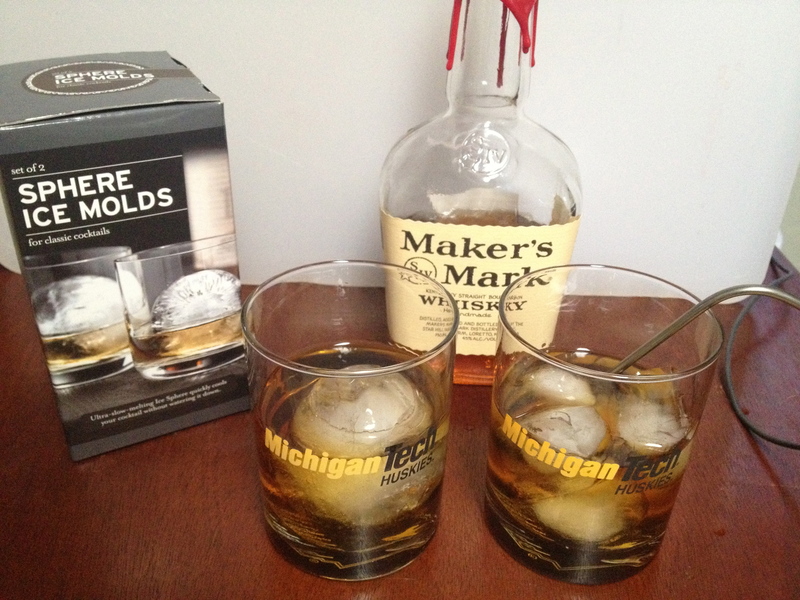 Temperature (ºF) of two glasses of Bourbon, one cooled using a sphere of ice, the other using five (5) ice cubes. Using this temperature data, it’s possible to compute the rate of change over time. Below is a graph of the temperature change over time. The rate of cooling over time for ice cubes and an ice sphere. Note: the noisy data for cubes was the result of a slight repositioning of the temperature probe. From this we can see that while both the sphere and the cubes managed the same peak level of cooling, the spheres peaked sooner and the cubes maintained a higher rate of cooling for a longer period of time. This resulted in more overall cooling by the cubes. If we look at the rate of cooling in conjunction with the amount of ice melted (see table below), we can see that while the cubes reached a lower final temperature than the sphere, and in less time than the sphere. The cubes did this by melting at a rate 43% greater than the sphere. In both cases the temperature change per gram of ice melted was nearly identical. Not only does the shape of the ice affect the rate of cooling, but it also had a surprising effect on what temperature the cooling appears to stop. Based on these results, ice cubes not only cool faster, but are able to chill bourbon to a lower temperature. This increased cooling however comes at the cost of increased melting, and dilution of the drink. Therefore the ice spheres do appear to melt slower, chill the drink in a reasonable amount of time, and dilute the drink less. However ice cubes are able to cool a drink more rapidly and to a lower temperature. Did the ice cubes only seem to cool faster due to larger direct contact with the probe? Would continual stirring affect the results? How do these cooling rates compare to say perfect cubes of ice, whiskey stones , or stainless steel cubes ? How would using amounts of ice with equal surface areas affect the results? Cool stuff. I like that there’s a blog out there that does science experiments. Should you need a volunteer to taste the drinks, I will happily donate my taste buds (In the interest of science of course!) .Very cool post. Yes, we examined those in a more recent experiment, comparing stainless steal to both whiskey stones and a well chilled glass. However the amount of cooling we measured was comparable to a well chilled glass but less than that of ice. Although if you mean these http://www.kickstarter.com/projects/745763505/spirit-steels-the-ultimate-beverage-cooling-device , we plan on doing some science to them as soon as we get our hands on some. Exactly like those! Although I have seen them on the market for a while so surprised they are on kickstarter? http://www.amazon.com/Stainless-Steel-Ice-Cubes-Tray/dp/B0083RBXOY Obviously there would be a far more optimum design with holes running though the middle to expand the surface area. Fancy starting your own kickstarter project? Yes, we’ve tried gel filled stainless steel, but have found that they only cool about as well as a well chilled glass. The thing that makes the kickstarter stainless steel cubes different/better is that they contain a substance that changes state (i.e. solid to liquid) which should give it a much greater capacity to absorb heat, as it takes a lot of heat to melt a solid. But by keeping the liquid contained, it doesn’t dilute the drink. very interesting stuff. but to be fair to the experiment shouldn’t you have used a single cube the same mass as the sphere? Yes, a single large cube with the same mass would have been nice, but sadly we don’t have a mold that can produce such a cube. We do have large single cube molds that produce 170g cubes. but putting 120g of water into them doesn’t produce a cube. Even if we could produce a single 120g cube, we still would have wanted to use cubes from our regular ice cube tray as a control. All the graphs go out to 180 seconds (three minutes). It takes me MUCH longer to finish a glass of Maker’s. I might take one or two sips in those first three minutes. But what about the rest of the time? What are the NEXT twenty minutes or half hour gonna be like? Is there any quantifiable conclusion on THAT? Is there still a cubes vs spheres difference then? Without a MUCH longer time axis, this “study” is virtually meaningless to a Maker’s-Rocks drinker. This non-scientist would assume that as the cube or sphere gets smaller, the rate of melting would accelerate. Depending on how strong you wish your whiskey to taste, the half hour would result in watered down booze regardless of the ice shape. I would suggest (if you drink more slowly than I do) mix with chilled water to your ideal strength or chill your whiskey. Or, as many purists would say, drink it neat.